Two photos I took during the 1990's of the replica riverboat TALISMAN on the Sangamon River at Lincoln's New Salem in Illinois which was a village where young Abe Lincoln lived from 1831 to 1837. A historical marker at an Interstate 55 rest area east of Springfield, Illinois remembers the steamboat TALISMAN's voyage. The TALISMAN, a "splendid upper cabin steamer," left Cincinnati on Feb. 2, 1832, bound for Springfield via the Ohio, Mississippi, Illinois and—most importantly to central Illinoisans—the Sangamon rivers. The venture raised hopes that the Sangamon could be a practical shipping route between Sangamon County and bigger markets to the south and east. John Carroll Power explained the problem in his History of the Early Settlers of Sangamon County, Illinois (1876). "To the first settlers of Illinois (transportation) was of unusual importance, on account of the vast extent of undrained soil, so rich and soft as to be almost impassible, in its natural state, for half of every year. For the transportation of heavy articles long distances, no other mode was though of except by water. They could be conveyed three or four times the distance in that way, much cheaper than on a straight line by any known method." The TALISMAN duly arrived at Portland Landing near Springfield in late March, prompting an outburst of optimism for the future of Sangamon River traffic. "Springfield can no longer be considered an inland town," the Sangamo Journal gushed on March 29. ". . . The result which must follow the successful termination of this enterprise to our county, and to those counties lying in its neighborhood, it would be impossible to calculate." "Thus ended the dream of navigating the Sangamo (sic), across which a man may walk almost dry shod for nearly half of every year." The site of Portland Landing and the story of the TALISMAN's attempt to open the Sangamon to shipping are the subjects of a historical marker at the Interstate 55 northbound rest area northeast of Springfield. Portland Landing was three-quarters of a mile west of the rest area. *Note: Despite Power's statement, there apparently was one more attempt to bring large-scale freight traffic to the Sangamon. The steamboat UTILITY went upstream in 1836, but it got stuck at Petersburg and ultimately was dismantled. As it happened, work began two years later to build the Northern Cross Railroad between Springfield and the Illinois River. Once railroads reached Springfield- the first Northern Cross train arrived in 1842—there no longer was any need to open the Sangamon to steamboats. A little early morning kitsch for y'all. 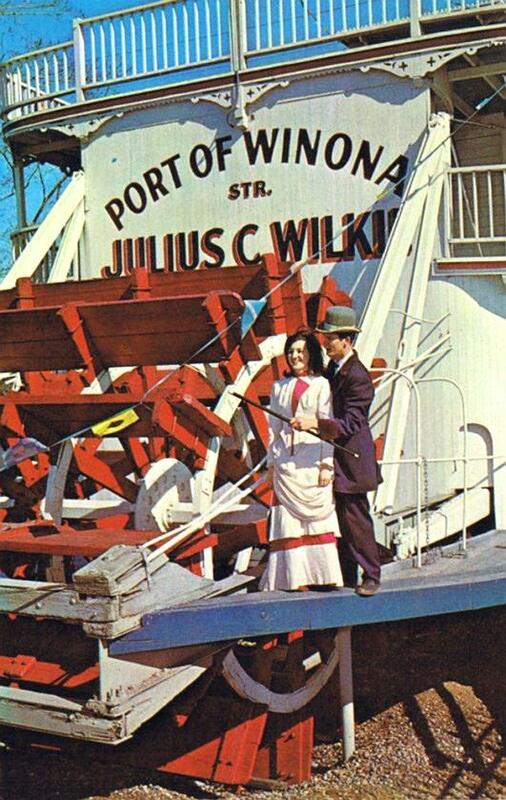 A promotional photo of a Winona couple in mellerdrammer costumes posing on the fantail of the JULIUS C. WILKIE. Is that gent wearing sneakers with his costume? Former Queen and King of the Prom from a few years earlier maybe? The WILKIE was "converted" from a perfectly respectable retired towboat into a "pseudo packet boat" for the tourist trade. The FLOYD was built in 1932, is 133 feet long, displaced 306 tons, and its draft is 36 inches.It was named in honor of Sergeant Charles Floyd, the only man who died on the Lewis and Clark Expedition.After it was decommissioned it was brought to Sioux City on the Missouri River in 1983 where it is dry-docked and serves as a Welcome Center for the tri-state areas of Iowa, Nebraska and South Dakota.It is located at 1000 Larsen Park Road in Chris Larsen Park. Taken at Cincinnati, Ohio in 1904. TACOMA, M.P. 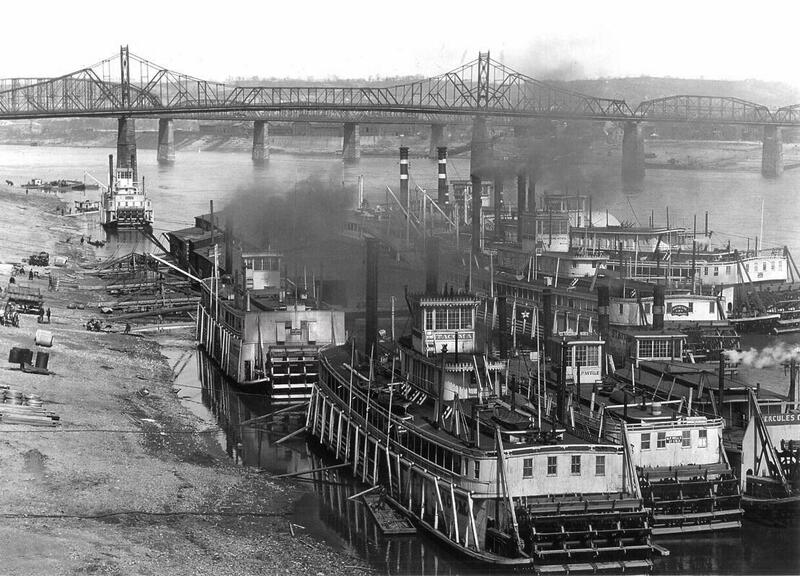 WELLS, HERCULES CARRELL (towboat), LEVI J. WORKUM, KEYSTONE STATE, PETERS LEE and CITY of LOUISVILLE. Apparently the 8th boat in the distance on the far left was too far away to be identified. A print of this exists in the collection of Marshall University in Huntington, West Virginia; the attached scan was made from a print obtained from an eBay auction. Beautiful photo of the DANDELION at Keokuk. Quite a few of the houses on the hill in the distance are still standing in that part of town which I have visited often. Nearby this location is where the towboat GEO. M. VERITY has been preserved on dry land since the early 1960's and there is a museum aboard that welcomes visitors. Sternwheel lighthouse tender that was originally built as the rafter F. WEYERHAEUSER at Rock Island, Illinois in 1893. She 140 feet long, 31 feet wide with a draft of 4 and a half feet. Engines were 15's - 7 feet. The U.S. Lighthouse Service used her on the Upper Mississippi and sold her at Rock Island in October 1927 to boat broker John K. Klein. She was lost in a collision with the towboat HERBERT HOOVER at Cairo, Illinois in February, 1929. 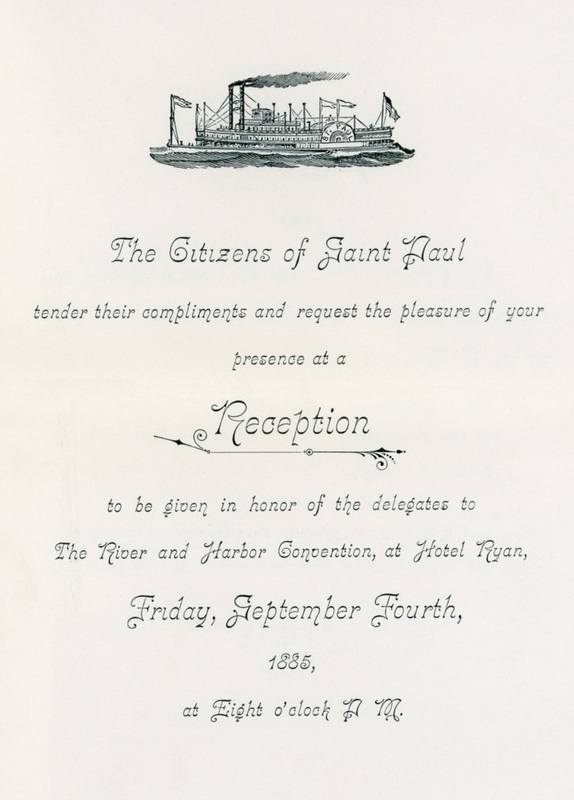 The Citizens of Saint Paul (Minnesota) tender their compliments and request the pleasure of your presence at a Reception to be given in honor of the delegates to The River and Harbor Convention, at Hotel Ryan, Friday, September Fourth 1885 at Eight o'clock P.M.
"Committees" included "Common Council," "Chamber of Commerce," and "Jobbers Union"
At the bottom of the 2nd page are the words "White Badge" - the significance of which is not known. 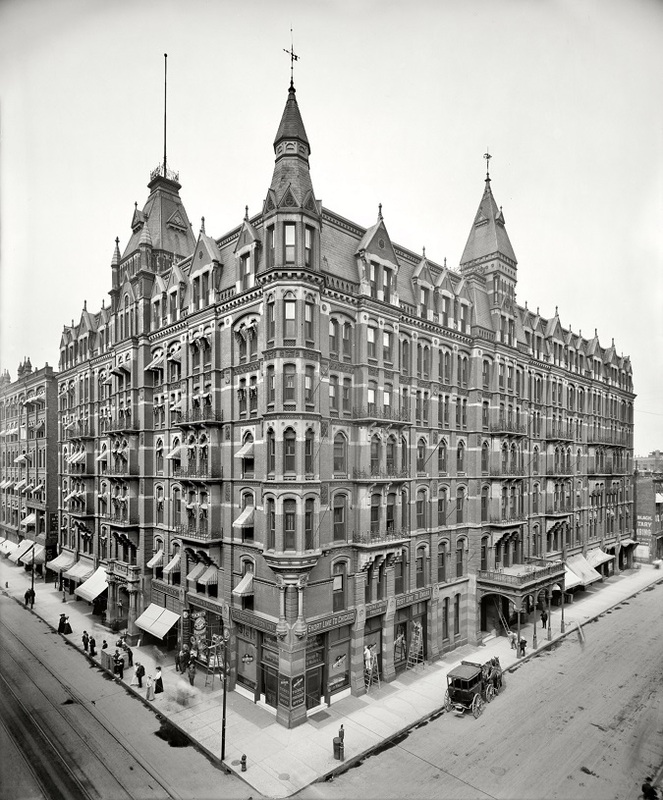 One of Twin Cities most luxurious hotels of the late 19th century was the Ryan Hotel in St. Paul. The founding and construction of the hotel was funded by Dennis Ryan, who had made a fortune mining gold and silver. The building was designed by architect James J. Egan, who came up with a huge Victorian Gothic creation that would be a landmark in St. Paul for years to come. Red brick and white sandstone were used to construct the huge walls. Terra cotta ornament, granite columns, arched windows, and bracketed balconies decorated the front façade. Out of the steep roof popped dormers, towers, and spires. The interior public spaces consisted of a bar, parlors, ladies rooms, a ballroom, and a billiards hall. The rest of the hotel held 335 sleeping apartments that ranged in size from one to six rooms. 300 had at least one fireplace and 100 had private baths. The Ryan had a long life of good service and even up to the end it was considered a decent hotel, but when it was losing too much money the owners decided to close it. In 1962 the building was demolished only to be replaced by a parking lot. The Minnesota Mutual Insurance Company building now occupies the site. Attached composite of 6 photos and Doug Walker's article relevant to the proposed restoration of the picturesque 1932 sternwheeler MYRA H. from the Rome, Georgia News Tribune from 2016. Talks underway for restoration of Myra H. a riverboat that last cruised 70 years ago Local historian and storyteller Bob Harris is taking the lead in an effort to restore and perpetually preserve the 60-foot-long Myra H.
The old paddleboat is all that's left of those boats that once traveled nature's original interstate system in the Rome area. The Myra H was built by Roman Pierce Harris, no relation to Bob, in 1932. He named it for his daughter Myra Harris. During a flood in the mid-1940s, the boat broke loose from its mooring but Pierce Harris managed to dry dock it on a farm off Collier Road near the Oostanaula River. He was a caretaker on the farm and used the boat as a retreat, a cabin-like type of getaway. Pierce Harris's granddaughter Kyle Vasser recalls spending a lot of time playing on the boat as a child. She remembers the big pilot wheel, four bunk beds, a wood burning stove and ice box that made it a great place to play. "I would play on the back, do gymnastic-like things on the paddle wheels, it was an awesome place to hang out," Vasser said. Linda Studard, another granddaughter, said she believes her grandfather donated the boat to the Junior Service League in 1983, which moved it to the Chieftains Museum property on Riverside Parkway. Years passed and the boat was moved to Mayo's Bar Lock & Dam on the Coosa River where it remains today. "She is now in horrible shape. Her forward deck has got huge gaping holes in it. It's got a window knocked out, a paddle is gone again," Bob Harris said. "It was my granddaddy's heart and soul," Studard said. "I'd love to see it maintained." Bob Harris has been knocking around the idea restoring the boat and moving it to a location adjacent to the River Education Center at Ridge Ferry Park and making part of the river-related nature center at the park. Harris said the priority is finding a place where the boat can be protected from the weather while it is restored. His idea is to put major supports into the ground next to the deck by the River Education Center. The boat could be put on the supports and covered with a roof extended over the deck. "That's a big wish," Harris admitted. Ben Winkelman, who manages the center, said he has spoken with Harris but nothing has been finalized. He recognizes there is considerable interest in riverboat history. Rome City Manager Sammy Rich has also talked with Harris. "We could preserve it and use it in educational way so I think there are some neat opportunities and ideas that need to be further explored," Rich said. "It's no great luxury ship, I just don't want to lose her," Harris said. "The Myra H used to go up and down this river and it's all that's left. 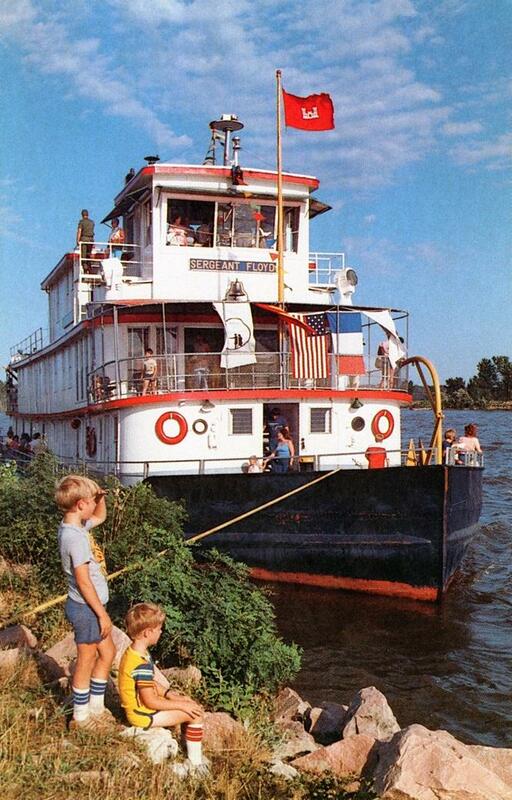 We have one last example of a riverboat that used to go up and down here all the time." Vasser and her stepbrother, Jimmy Lovelace, are supportive of Harris's efforts to restore the boat and have it put on display in a more appropriate location. "We have threatened to go and kidnap that thing; it's hard to watch it go down like it has," Vasser said. "It's everybody's challenge to make this happen," Lovelace said. "Right now it's like watching history fall apart. Bettye Jenkins was honored as Natchez Woman of the Year!!!! We Love You Mrs. Bettye Last evening at the Natchez Chamber of Commerce Gala, our very own Mrs. Bettye Jenkins was honored as Natchez Woman of the Year!!!! We are so blessed to have her as not only a member, but Past President, PGC Board of Directors, Homeowner and Treasurer for the past many years!! Mrs. Bettye is a wonderful example of Southern Charm, Grace and a True Steel Magnolia!! Thank You for ALL You Do for the Pilgrimage Garden Club!! Built at Jeffersonville, Indiana by Howard, 1908 cost $10,000 the merchants of Muskogee, Oklahoma and on her first trip up the Arkansas was "on a grand tour with freight and tourists aboard." C.N. 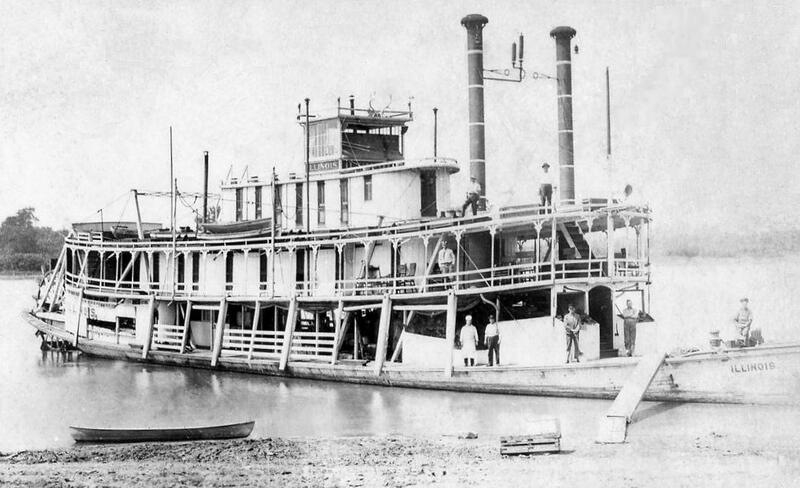 Haskell, who became governor of Oklahoma was one of the Muskogee persons who built her. She ran between Webbers Falls, Oklahoma (the river landing for Muskogee) and Fort Smith, Arkansas. 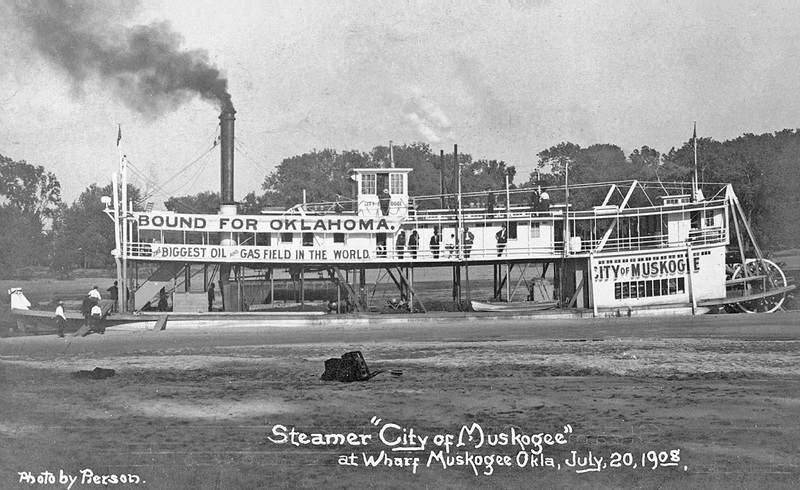 Low water and lack of freight defeated the project and she lay near Muskogee several years, then was bought in 1918 by Inman Packet Company. They ran her Newport, Arkansas to Black Rock, Arkansas on the White and Black rivers. She later ran Newport-Colver Bend to the F.W. Tucker plantation 25 miles below Black Rock. Then ran Crocketts Bluff to Rosedale, Mississippi handling rice for reshipment on the Yazoo and Mississippi Valley Railroad. Sold in 1918 to New Orleans, she was renamed Loraine K in 1922. This is a good photo just received today. I plumbed it and removed the flaws, converting it to grayscale from sepia. The contrast and detail appears to be stronger this way. We have several other photos of railroad transfer steamers and together they can get their own page one of these days. We also have an illustration of a railroad transfer steamer that served the Hannibal & St. Joseph Railroad that could go with the photos. Engines 26's - 10 feet - Four boilers, each 72 by 18 feet. Owned by the Frisco Railroad and operated at Baton Rouge, Louisiana. Her name was changed to WILLARD V. KING by the New Orleans, Texas & Mexico Railroad Co. prior to 1925. The Missouri-Pacific brought her to St. Louis in 1927 and she continued there until January 1940 when the transfer business was discontinued. She was condemned in 1901, rebuilt at Quincy, Illinois and renamed. Hull measured 139 x 26.6 x 4.8. Attached is a scan I made from a sharp focus 11 x 14 glossy print. Someone had done some heavy-handed retouching directly on it, outlining with a paint brush the 9 men and a boy in the picture. I subdued the retouching in Photoshop which was time consuming but rewarding as far as I was able to take it. Lewis Verduyn in New Zealand did some research and is pretty confident that the fish that the anglers were showing off were bass, not trout (who are more "sleek) according to him. The QUEEN was built by J. Herbert Lyon. It could move five carloads of freight at once, with a barge lashed on to each side while pushing another barge ahead. "Captain C.A. Waters in front of the pilot house Red Collar Line St. Joe run C & A"
On deck are 8 men, a boy and 5 bass. Steam navigation on Lake Coeur d'Alene in Kootenai County, Idaho lasted from the 1880s to the 1930s. 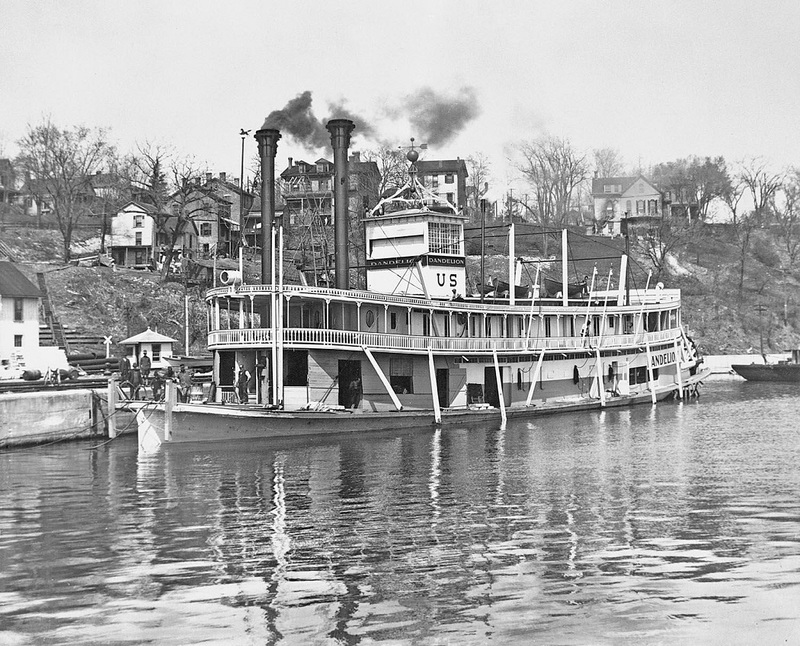 More steamboats operated on Lake Coeur d'Alene than on any other lake west of the Great Lakes. The high point of steam navigation was probably from 1908 to 1913. After that railroads, and increasingly automobile and truck traffic on newly built highways supplanted steam navigation, although some vessels continued to be operated unit the mid-1930s. 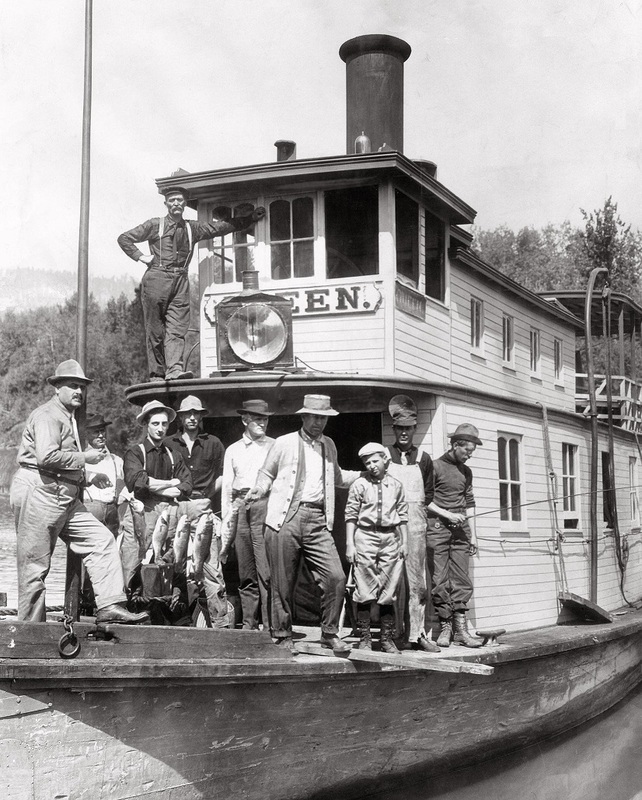 In September 1908, the Red Collar steamship line operated seven steamers on Lake Coeur d'Alene, which was 27 miles, running mainly in a north-south direction.The main city on the lake was Coeur d'Alene, at the northern, downstream end. By 1908 the city of Coeur d'Alene was connected by steam and electric rail lines to Spokane, Washington, about 30 miles to the west. The lake varied from 50 to 400 feet deep, and with the adjacent navigable St. Joe River, formed a natural water route just over 60 miles long. At the far southern end of the lake, flowing in from an easterly direction, was the St. Joe River, which was navigable for some distance. The St. Joe river was about 2,100 feet elevation above sea level, and it was claimed that it was the highest navigable river in the world. The St. Joe river valley was about two miles wide where the river flowed into the lake, narrowing to about one-quarter mile at the head of navigation. Within the valley, the river itself was reported to be at least 150 feet wide and 20 feet deep. Points on the river included Ramsdell, Hell's Gulch, Cosmos, St. Maries, Ducommon, St. Joe City, and Ferrell, or Ferrell's, generally considered the head of navigation on the St. Joe. 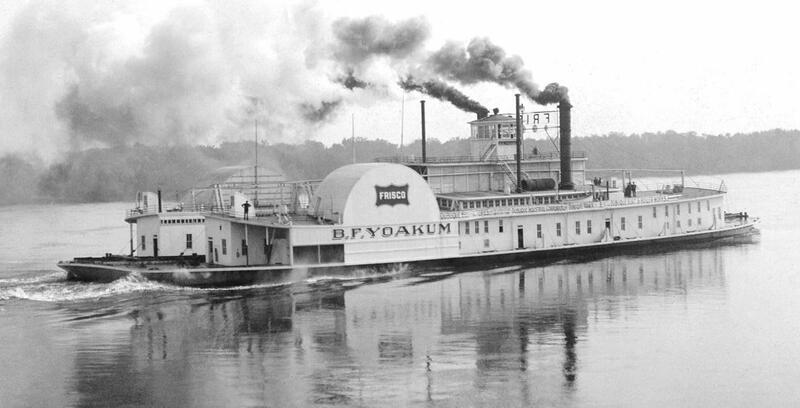 However, in 1896, the steamer ELK, under the command of Captain Reynolds, was able to reach Cottonwood Island, twelve miles upriver from Ferrell's. 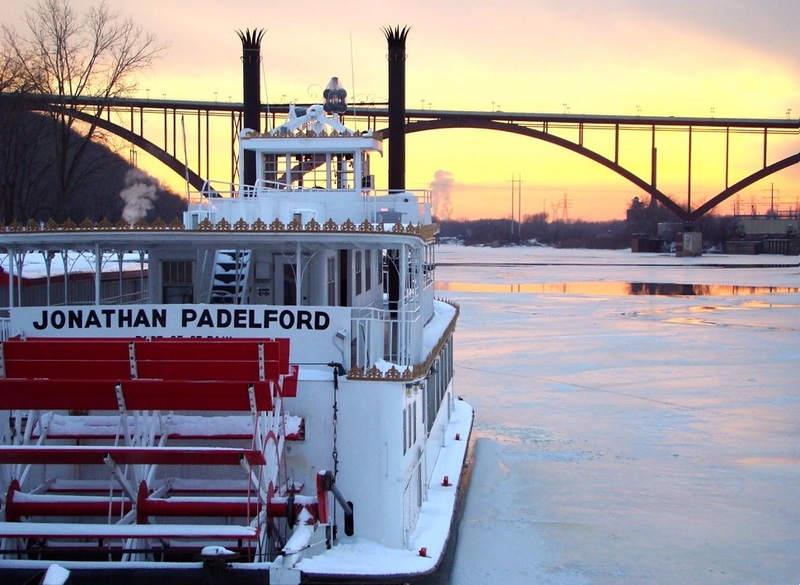 JONATHAN PADELFORD in winterquarters on the frozen Upper Mississippi River at St. Paul.We don't have a credit for this image but will be glad to give one if anyone knows who the photographer is. 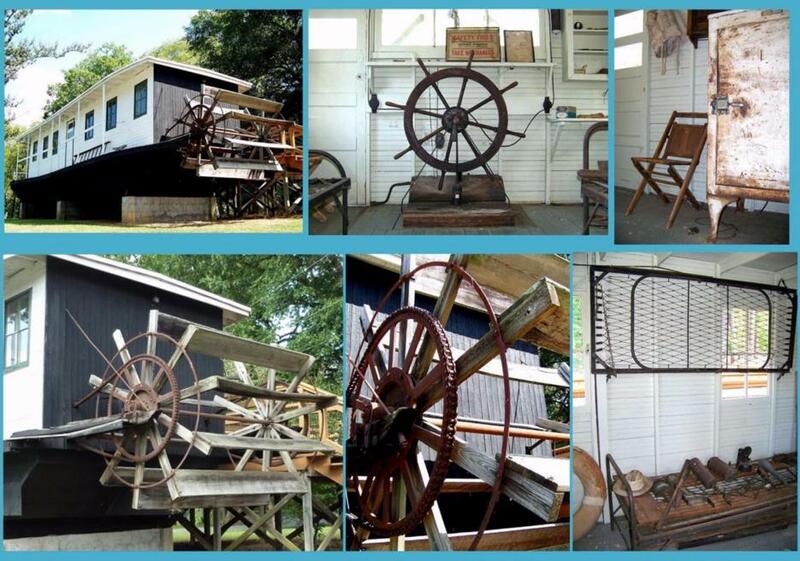 One of the few truly authentic sternwheelers on the Mississippi River, the all-steel vessel is namedfor the tenth great maternal grandfather of Capt. William D. Bowell, Sr., founder of Padelford Riverboats.The engines are identical to the old steam engines but run hydraulically. The sound of the steam is still there.Its overall length is 125 feet with a 24-foot beam. Coast Guard licensed to carry 200. JONATHAN PADELFORD in winterquarters on the frozen Upper Mississippi River at St. Paul. We don't have a credit for this image but will be glad to give one if anyone knows who the photographer is. 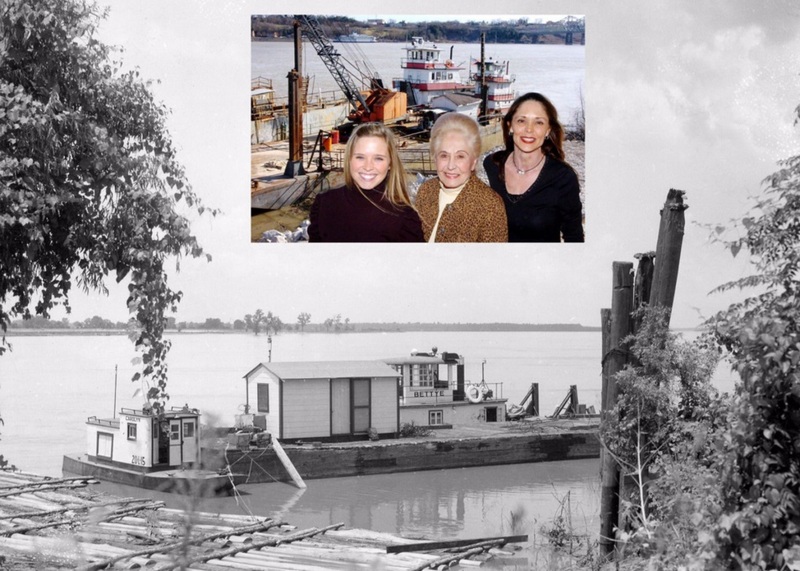 One of the few truly authentic sternwheelers on the Mississippi River, the all-steel vessel is named for the tenth great maternal grandfather of Capt. William D. Bowell, Sr., founder of Padelford Riverboats. The engines are identical to the old steam engines but run hydraulically. The sound of the steam is still there. Its overall length is 125 feet with a 24-foot beam. Coast Guard licensed to carry 200.